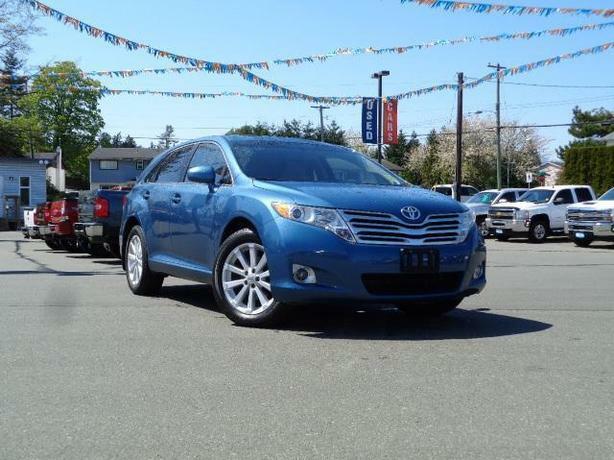 ***Was $17995, Low Kms, BC Vehicle*** This 2010 Toyota Venza is a five-passenger 4-door wagon. Features include alloy wheels, auto-on/off headlights, rear privacy glass, dual-zone automatic climate control, a tilt-and-telescoping steering wheel, a power driver seat, a reclining and folding 60/40 rear seat, an auto-dimming rearview mirror, cruise control, a trip computer and a six-speaker stereo with a six-CD changer, satellite radio, a USB port, iPod connectivity and Bluetooth. The 2.7-liter four-cylinder produces 182 horsepower and 182 pound-feet of torque. Estimated fuel economy with this engine and front-wheel drive is 20 mpg city/28 mpg highway and 24 mpg combined. Every 2010 Venza comes standard with four-wheel antilock disc brakes, stability and traction control, front-seat side airbags, side curtain airbags, a driver knee airbag and front-seat active head restraints. In government crash testing, the 2010 Toyota Venza earned perfect five-star scores in all frontal- and side-impact tests.